Sometimes people ask if I’m contacted by grooms or brides more often. I think it is actually close to half and half, with the brides contacting me just a little more often. 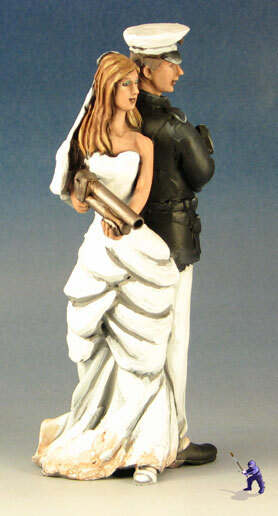 The very first one I did was a groom who wanted to surprise his bride with a topper where he wore a gas mask and she was a zombie in a red dress. At the time, I figured that either he has met the right person for him, or this wasn’t going to go over well. I was told after the wedding that she loved it. Needless to say, I work with a good number of less conventional brides and grooms. Here is an example of a a few brides who were not wearing a white dresses.